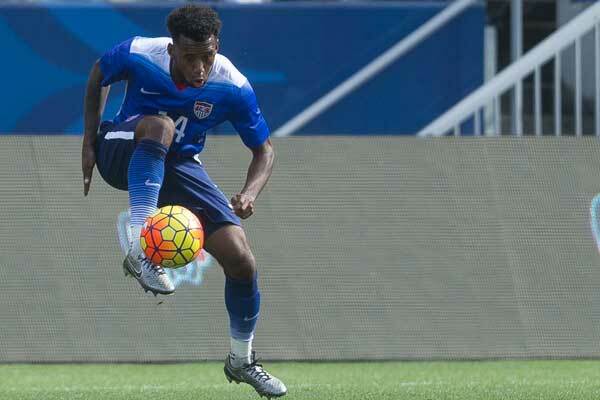 The soccer news starts with USMNT players in action in England, Germany, and Mexico. In the Premier League, DeAndre Yedlin's Newcastle United beat Manchester City 2-1 at St James' Park. Falling behind in the opening minute, Salomon Rondon equalized for Newcastle in the 66th. Matt Ritchie converted a penalty in the 80th minute for the game winner. Newcastle is in 14th-place in the Premier League and reports having them completing a deal for Atlanta United's Miguel Almiron for an MLS record transfer fee. “We lost second balls, we were not aggressive enough, that’s why we could not win," Manchester City manager Pep Guardiola said. "Our game was slow, we didn’t commit. They shoot the first time and it’s a goal, the second was a penalty. But congratulations to Newcastle. It’s difficult. But we have to continue. In football many things can happen. The table is not important. We have to do what we have to do." Tim Ream subbed out in the 27th minute for Fulham's 4-2 home win over Brighton. Fulham needed a comeback after falling behind 2-0 from the 17th minute. Calum Chambers pulled a goal back in the 47th with Aleksandar Mitrovic equalizing in the 58th. Mitrovic scored again in the 74th with Luciano Vietto adding a goal in the 79th minute. "These three points mean that we are alive, we can see a little light but it is only a little step forwards," Fulham manager Claudio Ranieri said. “I want to keep seeing this fighting spirit shown this evening. For us every match is tough but they are crucial because we are in the relegation zone. We are confident – this match and result tonight was very important for us." Matt Miazga made his debut for Reading in their 1-1 draw at Bolton Wanderers. Nelson Oliveira put Reading up from the penalty spot in the 74th minute with Bolton equalizing two minutes into stoppage time. It was also Oliveira's first game for Reading. The club is 22nd in the Championship, a point from safety. "We showed good things again, we played with enough quality, and we created enough situations to win this game," Reading manager Jose Gomes said. "So we are disappointed with the result. But we are full of confidence in these players. In the moment we’re living, the game was very important. For one side we’re disappointed, but on the other side, the way that we’re playing and the confidence the players showed in our process gives us big hope for the future." Cameron Carter Vickers's Swansea City drew 3-3 at home with Birmingham City. Swansea took the lead in the 22nd minute through Daniel James with Birmingham equalizing in the 35th. Birmingham City went a man down in first-half stoppage time. Oliver McBurnie pulled a goal back for Swansea in the 65th with Birmingham City equalizing through an own-goal two minutes later. Birmingham City took the lead in the 71st with McBurnie equalizing for Swansea four minutes into stoppage time. "I’m buzzing to get the goals, but I can’t help but feel disappointed with the result," McBurnie said. "I thought we dominated most of the game, but we conceded three sloppy goals. When you score three goals at home against a team with 10 men, that should be enough to get the three points." Joe Gyau subbed out in the 55th minute for Duisburg's 2-1 loss at VfL Bochum in the 2.Bundesliga. Trailing by two goals from the 21st minute, Havard Nielsen scored for Duisburg in the 79th. In the Copa MX, Omar Gonzalez's Atlas lost 2-1 at home to UNAM Pumas. An Osvaldo Martinez penalty put Atlas up in the 53rd. Pumas equalized in the 56th and scored their winner in the 84th minute. MLSsoccer's Tom Bogert talks to Caleb Stanko about his move to FC Cincinnati. SBI Soccer's Franco Panizo with Sporting KC coach Peter Vermes's response to the Ike Opara trade. The Atlanta Journal-Constitution's Doug Roberson with what Atlanta can do after Miguel Almiron. FourFourTwo's Matt Ladson explains what FSG's ownership has meant for Liverpool. Inside World Football's Andrew Warshaw talks to Ramon Vega who might run for the FIFA presidency.